How To Create A Church Directory With WordPress Church Directory Website Template? Do you want to create a church directory website that lists all the churches in your city/province? Here’s the best way to do so. 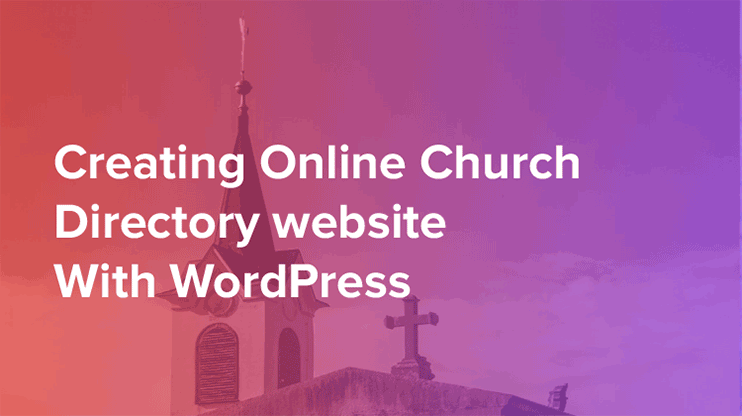 In this tutorial, we will see how you can create location-based church directory websites with this WordPress Church Directory software, in just minutes. These directories can show all the churches listed on the maps so that your visitors can find them easily. Moreover, we will create customized church photo directory software where visitors can register and submit their church listings. Also, we can allow people to add church listings to our website. Also, we’ll talk about a few ways you can earn through your church directory website. Create full featured Church website with WordPress. The Church theme is completely customizable and you can create a website without touching code. 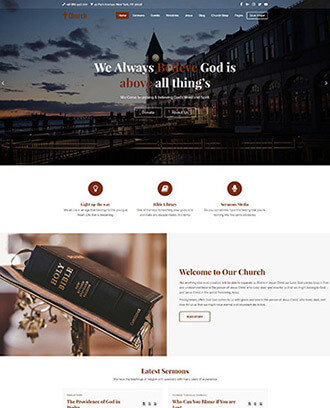 The church theme includes all the features like Sermons listings, Events listing, Accepts donations, WooCommerce Selling option, Blog, All with this pourposfully designed theme. To start off with any kind of website, as you already know, we need two things: The domain name & subscription to a host. First of all – you must decide on a name for your church directory. Actually, a few names! Because based on the name of your website, you can procure the domain name. Now domain name can be acquired from any of the best domain name services like Godaddy, NameCheap, etc. 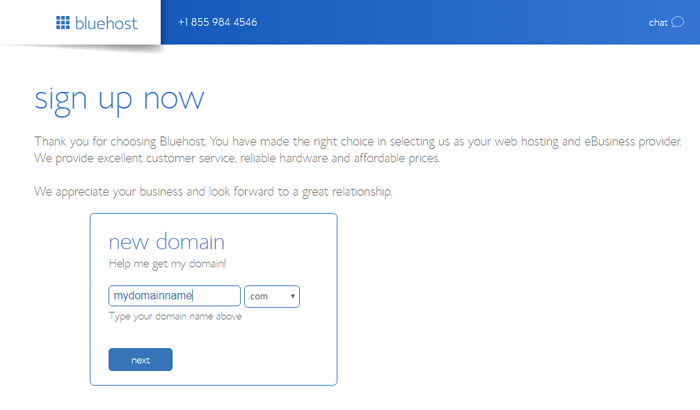 I always rely on BlueHost for the domain name. To subscribe to3 a domain name, you can navigate to the domain section of Bluehost and use the search bar to search for the name you want. If the name is available, you can add it to your cart and pay for it. If it’s already taken, you can try another variation. While you choose a domain name, make sure that it is simple, short, easy to remember and spell. Logical domain names are easy to memorize and are less prone to be mistaken. Therefore, choose your domain name very carefully. Once we have the domain name, we will register for an efficient server to host our church directory website. A directory website is has lots of sensitive data and listings. Also, the amount of expected traffic is high. So be careful when you choose hosting for your Church Directory template. 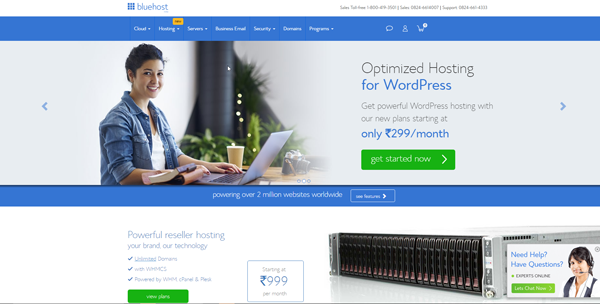 I prefer Bluehost’s WordPress optimized hosting for a directory website’s hosting requirements because it is affordable, reliable and secure. You can choose your hosting service based on your requirements and the best service according to your location. I have chosen this sleek and affordable church directory software for creating a church directory. Because it has a minimal design, that can be easily customized and updated for use. Moreover, we want to create a location-aware Directory website where the church listings are displayed with their exact locations on Map. So, the Listings with its inbuilt features can prove to be the top church directory software that will make your work easier. Now that we have all the important decisions made, we will start with website building. The Listing WordPress theme that we have chosen to create our Church Directory Listing website is like a ready to use website. All you have to do is to install the theme and the sample data provided with it. With this, your WordPress website will be configured with all the features of a directory website. If you don’t want to spend time looking for hosting solution, there is this directory platform that you can use to create any kind of directory website easily and quickly. Generally, to create a directory website with programming takes days, if not weeks. But with this Directory template, creating Online Directories is a matter of minutes. With the installation done, you can start adding the listings on your website. But before that, let’s make a few changes to the appearance of the theme to make it look like our website. 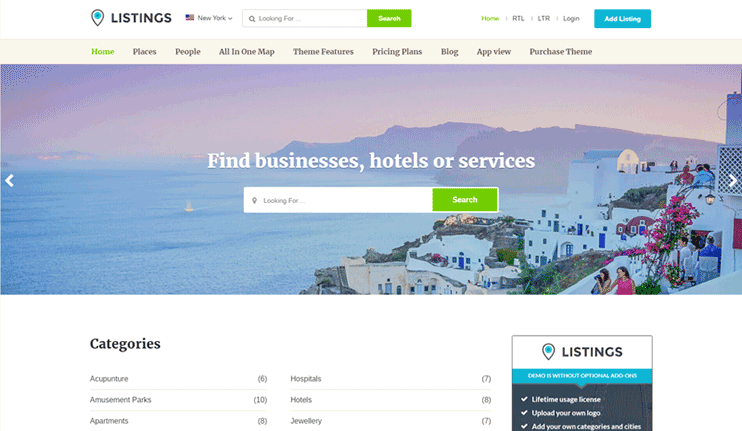 The location directory WordPress template is a multipurpose WordPress directory script. This WordPress template can be used to create an online directory of almost any subject. To create a church directory website out of it, we will customize and personalize it to suit our subject. We will start with the rebranding of the Location WordPress directory software by uploading our logo and changing the colors of your church directory website. If you have your logo image ready, it takes less than a minute to upload and set it as the logo of your website. The logo and the site title options are related with the identity of your website. Therefore, we will change them before we proceed with anything else. Along with the logo, the footer credits also tell visitors about the ownership of your website. You can easily customize the footer text and change it to whatever you want to completely re-brand the Church Directory WordPress template. The color of your website has a great impact on your visitors. It is always said that it is the content and usability of your website that matters. However, the design and appearance of your website matter equally. Choosing the best colors of your website will make it eye pleasing for your visitors. The Listings Directory WordPress Template lets you choose the color of your website with a color picker. For your convenience, the color scheme of your directory template is grouped so that you don’t end up messing up the existing design patterns. However, even the current color combinations of the Listings WordPress Directory Script is ideal for a church directory website. So if you are in a hurry to make your website live, you can skip this step and concentrate on it at a later stage. The homepage is inarguably the most important page of your website when your website is new. It is a gateway for the visitors to find the other pages on your website. But, what shall you show on the homepage of your church directory website? Buttons for essential user actions – “Add church”, “Add an event”, etc. With the sample data install, all these details will appear on the homepage of your location directory script’s homepage. However, sometimes you may want to restructure your homepage. This can be to add an extra detail on the homepage or for any other reason. Therefore, the homepage of the Listings Directory WordPress template is totally widgetized. To change how your homepage looks, all you are supposed to do is to drag and drop the widgets in and out of the widget areas. This makes rebuilding the design of your homepage easier. The more you care about providing the best facilities to your visitors, the more your business grows. For a church directory website, it’s always a plus if you are able to show people the church listings that are closer to them. With the proximity search feature, your Church directory website will filter the church listings and show the visitors the listings that are closer to them. 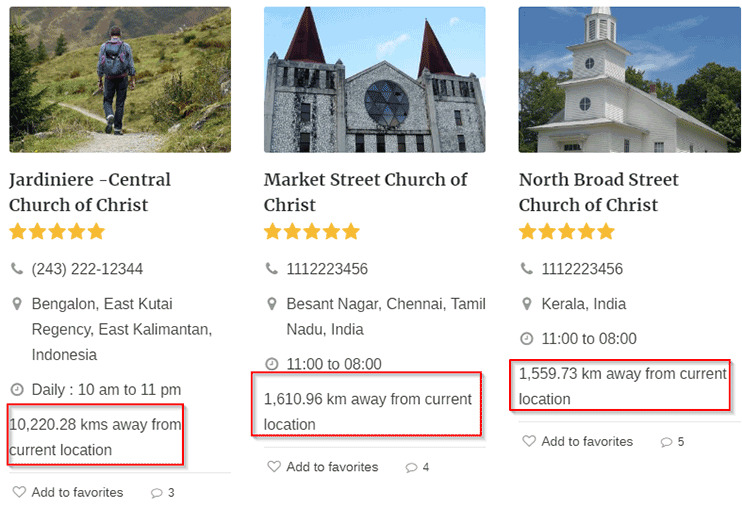 Also, the Listings Directory WordPress template is configured to display the distance of a particular church listing form your current locations. 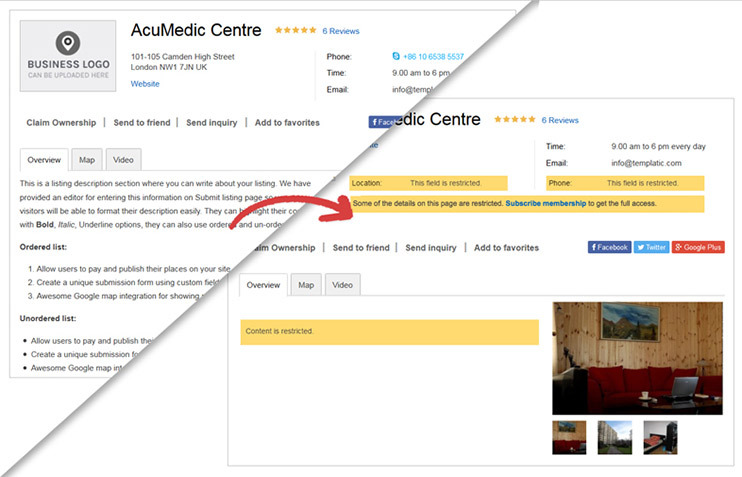 To help your visitors even further, the listing detail page comes with a map showing the location of the church. Also, your visitors can get a navigational track to the church trough the navigational features provided by Google maps. Online directories are all about the listings under different categories. So, before we start adding listings to our Church Directory website, we will create all the possible categories for our website. Generally, when you create a multipurpose directory website, like restaurant directory, there will be many categories and sub-categories. However, for a church directory website, there will be limited categories (or no categories at all). Similarly, if you are allowing event listings on your Church Directory website, you can create separate categories for your events too. When you are allowing paid listing submissions on your website, you will need to present some pricing plans to your customers, right? 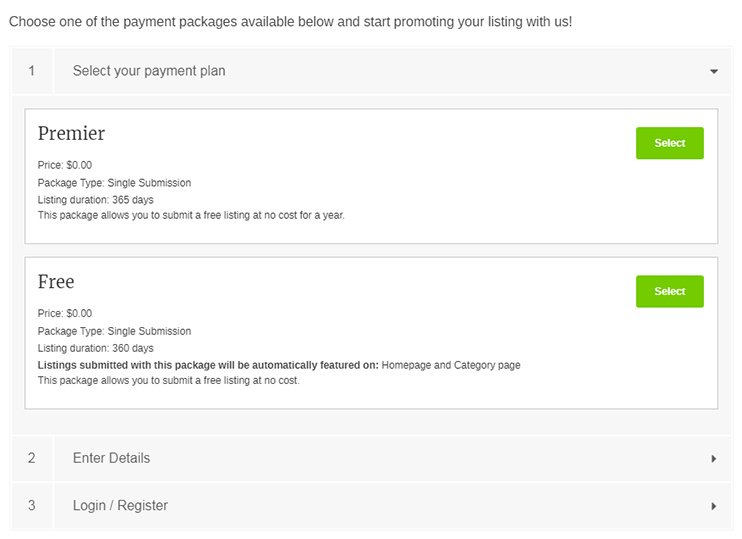 So now, for paid submissions on your Church Directory website, you can create all the pricing packages that you want. The pricing packages can have different values for the number of listings allowed to be submitted under the package, the validity of listings submitted under it, the categories allowed, etc. 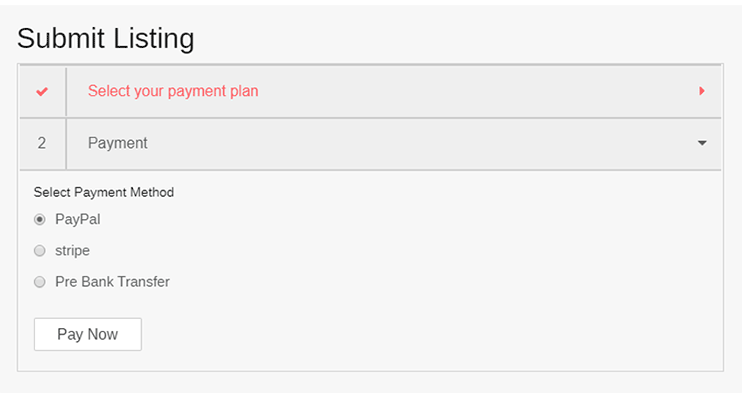 To create a pricing package, you just have to simply fill up a form with all the values you want and press “Create”. This will create the pricing package and it will start at step 1 of the Listing submission form. Note: You can even display them as pricing tables to be displayed to your visitors to make it more convenient for them to understand. So another important feature of your church directory (besides displaying location-based church listings) can be events listings. Besides being a church directory, your website can serve as an events portal that displays religious events. Event organizers are always looking for a way to promote their events and attract more audience. However, if your church website, provides them with a way to promote their religious events through your website, it’s a win-win situation for both of you. To do so, you can integrate the events add-on on your location church directory WordPress template. This addon turns your WordPress Church Directory into a fully fledged event portal in minutes. For your church directory, you can allow free or paid listing submission on your website. For any kind of submission, the visitors will be first asked to create pricing plans. We will start with the free package that allows free online church directory listing submission. You can create a free package just by entering 0 as the amount. Further, you can decide the rest of the terms for your package. Once the package is created and saved, it will start appearing to the visitors on the front end submission form. The visitors can then choose the package of their choice and submit their listing on paying the determined amount. The Location Church Locator Directory Software comes integrated with PayPal, therefore you can start collecting payments instantly if you have a merchant account with PayPal. Also, this software for church directory lets you integrate a wide range of payment gateways to accept payments. If you don’t want to rely on PayPal and want a new way to accept payments through your directory website, you can choose from the payment processors available here. One of the easiest ways to monetize your Church Directory website is through paid listing submissions. The pre-requisites of it is a site with good traffic and credible content. Only when your Church Directory is popular and has a decent traffic will the users want to add their listings on your website. However, there are other ways. And the first one is – displaying advertisement banners on the website. This method of monetization works with almost every kind of website. If there are businesses willing to advertise themselves, through your website, then you are all set to make some money through your website. Besides, you can use Google AdSense. It’s a service to let you display targetted advertisements on your website. Here, the best thing is, you won’t have to get in touch with the advertisers and convince them to get promoted through your website. The Google AdSense service acts as a mediator, to provide right advertisements to right people through your website. You can subscribe to it, assign spaces for Google advertisements and start earning through your website without many efforts. The church Directory WordPress theme has it all to let you display your events. All you need to do is integrate an extra plugin if you want to start displaying the events held at different churches. 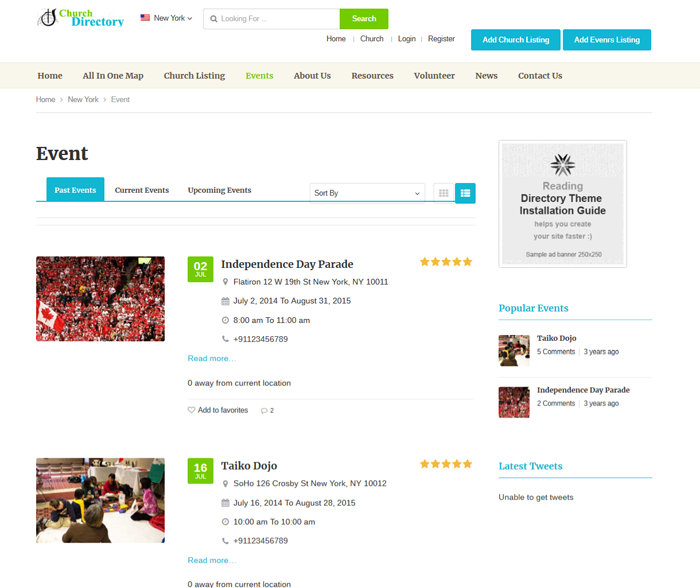 This will let you create and display events on your WordPress Church directory website. Therefore, with this Church Directory website, you can even create a portal that lists all the religious events. Here, you can make money by selling entry coupon/ticket to such events. You can create an online community website with membership using this Church Directory template. Here the access is limited to the members only. The member of the website must pay a fee (*typically monthly fee) to access the listings or part of them. 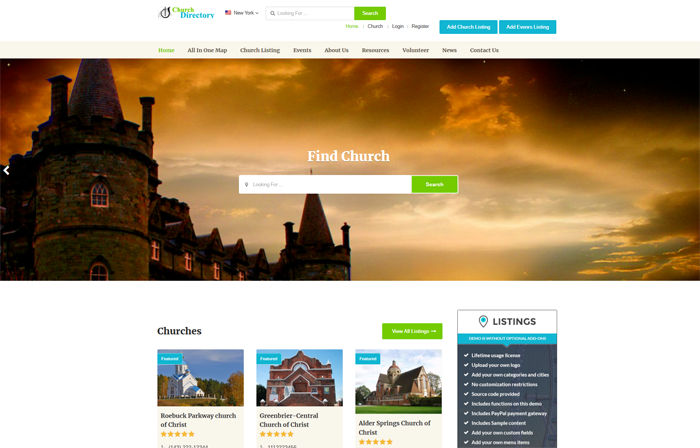 With the Listings Church directory template, creating such websites is easy. The website created with this Church Directory template, may or may not be commercial. Whether you decide to monetize your website or not, you’ll sure want your website to be popular. It’s is very important to let people know about your Church directory website and there are several ways you can do this. Below listed are few ways you can promote your Church directory website. The church directory template comes with inbuilt features that can help with the website promotion. Let’s talk about the share buttons. The share buttons are designed to let your visitors share the pages of your website on their social media account. For instance: There’s one visitor who is interested in one of the church listing on your website. So all he’ll need to do is to click the share button and take it to his social media and share it with his friends. This is the easier way to let your visitors contribute to promoting your website. Besides the options through which you can promote your website online, on the internet, you can take help of the local channels to advertise your church directory website. If your Church directory website is for a city or a certain geographical area, you can use the local channels to promote your website. The local people are going to be the audience as well as the users of your website, therefore, you can rely on any media that can spread a word among the local people. With front-end submission enabled, people will be able to register and submit their listings on your website. The Location church directory template comes with an efficient spam check feature to check the registrations and submissions. However, when the users submit their listings, you as an admin should have a look at it in order to make sure that the information provided is correct and precise. It’s up to you if you want the submitted listings to go live instantly or to hold them in moderation. You can manage this using the settings options. If you decide to not publish them as they are submitted, they will be saved as drafts and then you can verify the details and publish it. Another important maintenance task for your directory website will be to remove outdated data or the data that is no longer valid. Even though most of the processes of this Church directory template are logical and automatic, there’s no harm in maintaining a check on the content, posts, articles, and pages to find the outdated content. Blogs are good for the SEO of your website. Besides, they help you keep your visitors engaged. They are a great way to keep the interaction with your visitors active. Moreover, you can use this section of your website to keep your visitors updated with the latest news and updates regarding your website. The comments on your blogs helps you track user engagement, know the opinions of your users and also keep your website updated with fresh content in form of comments. You can also allow your visitors to submit their online church directory reviews on your site and have additional unique and fresh content that search engines demand. If you have been looking for an answer on how to make a church directory free – Without paying to the professional developers or designers, here’s how you can do it. The listings Directory template is one of the best downloadable church directory software for small church directories as well as massive church directories. If you are looking for the best free software to use for church directory, you’ll probably end up wasting your time and efforts. Instead, use this affordable church directory software get started in just minutes. So now you won’t have to wait for the designers and the programmers to get the work done. If you can spare a few hours for a few days, you can start your online business, all on your own. All the options and settings available at the dashboard of your Church Directory website as simple and intuitive. Plus, you get an installation and use guide with the listings church directory template download. If you are still confused about the options and alternatives, don’t hesitate to get in touch with our support team.